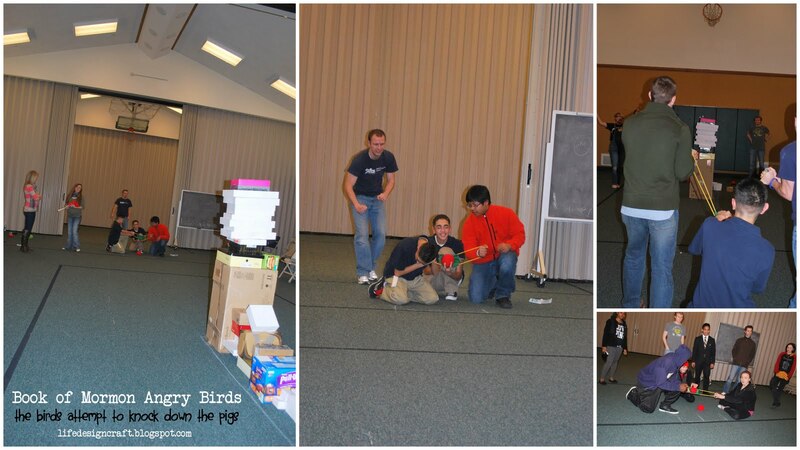 My friend and Young Women counselor, Melanie, planned this super fun combined youth activity last week. The "kids these days" are obsessed with Angry Birds (okay who'm I kidding? 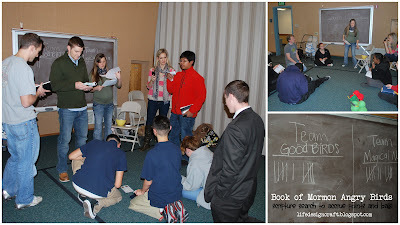 kids, adults, my husband...they're all obsessed with it)... so she incorporated a Book of Mormon scripture search contest into this popular quirky game. She made the pigs and birds herself...homemade bean bags! We had the youth and leaders collect boxes well before the activity so we'd have a variety of sizes and shapes for setting up the structure. 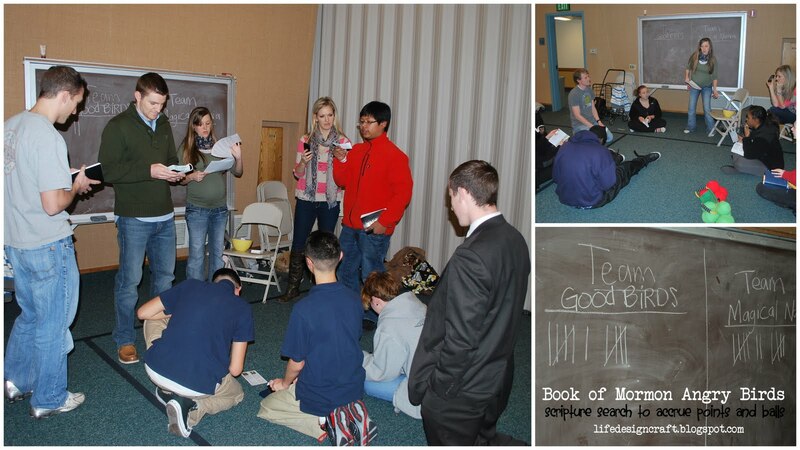 They drew Book of Mormon trivia questions from a bowl and were allowed to use their scriptures to answer. They had only 3 minutes and could answer up to 5 questions (but each question had to be answered correctly before drawing a new question). 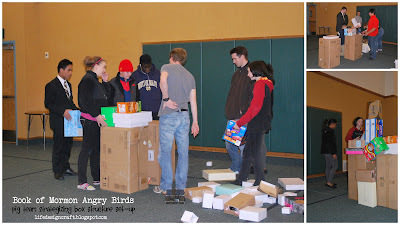 The number of questions they got right were the number of pigs/green balls they got to set-up in their box structures for the next team to try to knock over. Next, they got to work building their structure within a marked off area (following certain rules previously established). They could use as many boxes as they wanted, make it as tall as they wanted, and put the green balls/pigs wherever they wanted as long as it was possible for them to actually fall. 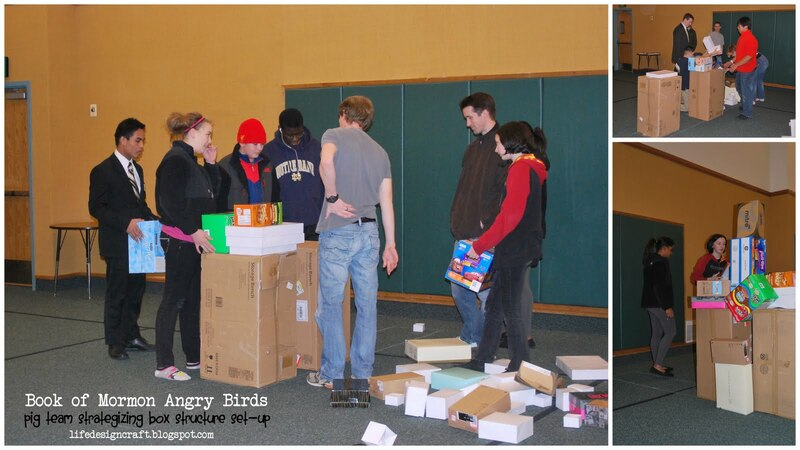 While they were busy building, the other team was now answering questions, only they were accruing red balls/birds. The more they got, the more chances they had at knocking down the box structure and the green balls/pigs hidden within. When that 3 minutes was up, it was time for the birds to knock over the pigs! The designated shooter(s) would aim and shoot, while the rest of the team was next to the box structure telling the shooter where to aim! (sort of like "zooming in" on the real game). We had a sling shot, but it broke half-way through, so the youth just used their hands to throw/shoot from then on. It worked just as well. If this team knocked down all the pigs/green balls to the floor, then they'd get 2 points on the board. That ended the round...then, it started all over...in reverse order. The previous red ball team was now the green pig team and answered questions first. We played until time was out and then served cookies. It was a fun activity! Thanks, Mel, for letting me share! There are TWO great giveaways going on now! I love how you "spit" them into groups.LOL I am a word freak - makes a good laugh for typing errores I do them all the time! Great IDEAS keep them up!! haha... yup, that's how we do it in Boston. We spit the kids up. :) I usually am pretty careful, too...can't believe I missed that one! haha! Can't get it to download and open. Could you email me the file? Thanks - I love this! I just emailed you the file, Korine! Can't get it to download and open too. Fantastic idea! Thank you so much!! Awesome, thank you for sharing. Roughly how big were the bean bags? We are doing this activity in May and are wanting to make bean bags also. Thanks! Brianne - I'd say about 5-6 inches in diameter for the regular sized bags and about 7-8 for the large one. A little tip, though: some of our bags broke spilling beans everywhere! I'd recommend putting the beans inside of some sort of plastic bag or casing before wrapping with fabric. That'll keep the beans in place and less likelihood of the bags ripping. If you don't do that, then just make sure the stitching is done well! Good luck in May! This is sooooo awesome! Thanks for sharing it came just in time for me to plan for our combined activity this month! This is great. I will for sure incorporate this into our combined YM/YW activities. I just found your blog and I might have to borrow your idea for our YW. Thank you! 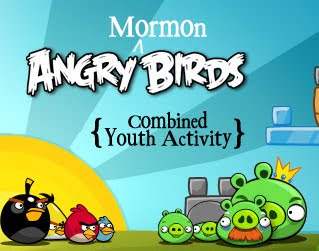 We want to have Book of Mormon Angry Birds as a combined activity but for some reason I can't get the file to download at all. Can you help me with this or email me a link that works? This looks SO FUN! The youth are excited! I couldn't get this to download...would you mind e-mailing me the link? Thank you for sharing your wonderful ideas!! Just sent it to you, JoLynn! Just found this on Pinterest and thought how cool! Then I recognized your face on the blog! Very cool Cher! I didn't know you had another blog besides your love actually one. I can't this get this to download either! Darn! Would you email me the link, etc. so that I can get the questions and all of the good stuff that's Zipped up? I would so appreciate it! I couldn't get the zip file to open. Can you email it to me too? PLEASE!!! This would be a great fit for our youth conference. Love this!! Can't get the zip file to open either - keeps giving me a bandwidth error message. Can you email it to me as well? we did this activity tonight and it was a HUGE hit! Thank you thank you thank you! We had new beginnings last week and I was feeling overwhelmed about putting on a combined activity for the next week and almost scratched the idea. You had it so well organized that I was able to pull it off. The only change we made was we had the first team answer questions while the other team built the structure and placed all 5 birds on structure. That way both teams were doing something at the same time. They received birds to launch for each of the 5 questions they got right. Great idea! We're doing this activity in a few weeks with the youth and they are really excited. Is there anyway to get a copy of just the BoM questions without the answers? That way I could print and cut up the questions without having to re-type them. I tried to copy and paste the downloaded file but it won't allow me. Thanks for this amazing idea! Would love to get the question/answer file emailed too. a.h.bustamante@prodigy.net. THANKS! Could you send me the question and answer trivia? jenniferspencer_2002@hotmail.com My YM and YW will love this activity! Thanks! Can't get file to open, email please? sista5hatch@yahoo.com. Thanks! I can't get the file to open. If you could email it to me that'd be great. Thank you so much for the great idea! We are going to have this for our combined mutual activity and the youth are excited.